Amazing limos and limo buses in an amazing city! In a city as busy and incredible as NYC, people expect the best, and that includes when they go to rent a limo or bus for a special event. That's where we come in. We honestly have the greatest vehicles in the state. 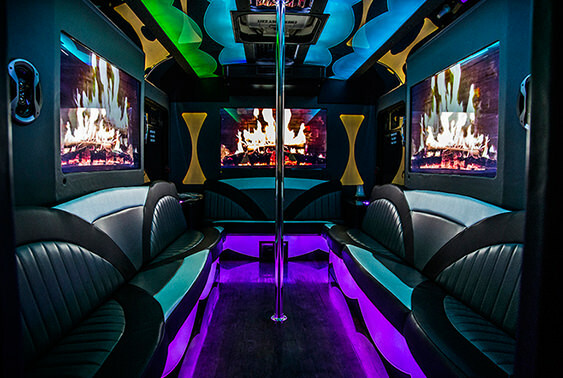 Not only are our buses inspected daily but they are cleaned before and after each trip, our vehicles are fitted with the nicest amenities ranging from LCD/LED televisions to sound systems of the highest quality, to bars topped with granite, to stripper poles to let you dance the night away! Leather upholstered seats, hardwood floors, and vibrant lighting top off the stylish interiors. We can even customize our vehicles for your special event whether it be a wedding, bachelor party, or a birthday. Just ask us! We offer some of the largest buses with the best designs in NYC. We offer a wide array of vehicles which allow for our guests to check out a wide array of attractions in the New York area. We service all of the boroughs and beyond and we operate 24 hours per day, so you can call on us for anything! NY has so much to offer from museums to historical sites, Broadway theater, great bars and restaurants, and so much more. 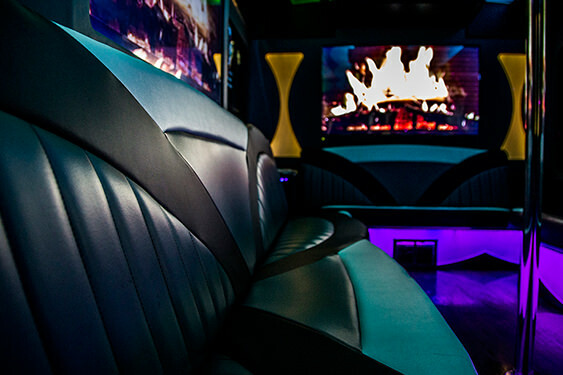 As you can see above, our vehicles are an oasis, with large TVs, colorful lights, and complete privacy, You'll feel more like you're relaxing in a VIP lounge at a hot new club than on a bus! Check out some of the great places to visit below and read on to learn more about some of the vents we service the most often. If you have any questions, give us a call, you can reach us any time 24 hours per day! We have the limo buses you need for your NYC birthday bash! Whether it's a child's 10th birthday, a bar or bat mitzvah, Quinceañera, Sweet 16, or 21st birthday, a limousine or bus is a fantastic way to transport guests to and from the celebration! Bachelorette parties are another of our most commonly serviced events. Whether you plan to hit all the bars and clubs and dance the night away, or spend a relaxing afternoon at the spa, there's no better way to do it than in a limousine! Perhaps the number one event we get called for is weddings! There are some absolutely stunning wedding venues all across the city and our limousines have the style elegance to match! Call today and ask about our wedding package! When there's heavy traffic on the way to a Knicks or Yankees game, it can really put a damper on the mood. Who likes to sit in traffic? When you have a luxury bus, you'll be too busy relaxing and drinking. It's a great way to tailgate, too! We often provide luxury transportation for groups attending live music events. Our vehicles have outstanding stereo systems so you can get pumped up for the show with music, dancing, and drinking as you ride! There's no better way to travel! Don't see the event you're hosting mentioned above? No worries! We're here to give you the very finest luxury transportation no matter what New York celebration you've got planned! Call us anytime 24 hours per day to learn more!